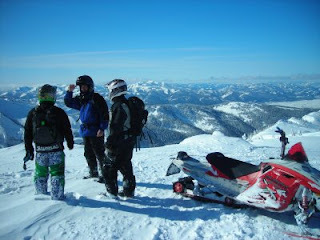 I've been wanting to do an epic day on the snowmobiles for a while now. When my buddy Jon asked if I'd be up for a mid-week ride, I couldn't say no. 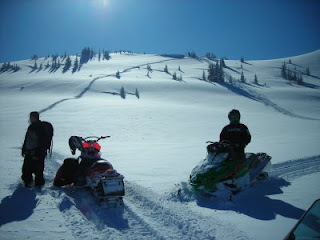 Longtime local riders Brandon & Cody joined us, and led the way to powder bliss. There's nothing like a 360-degree, crystal-clear Teton view from 11,000 feet to put things in perspective. "Wow," was the word of the day. 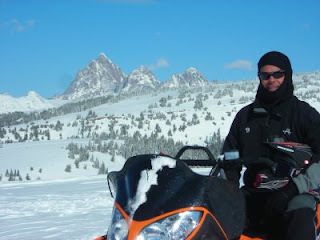 From this vantage point, we could see the top of the Jackson Hole tram, the top of Grand Targhee's Dreamcatcher lift, the Grand Teton, Mount Moran, all of Teton Valley, the entire Big Hole & Palisade mountain ranges...and beyond. It was better than any movie, and we were in it. Let's ride! 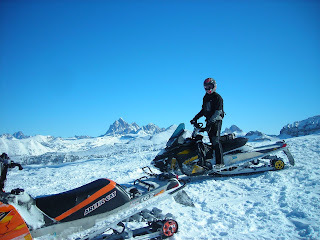 Early in the day, taking a brief break and recalibrating sleds. Snow conditions were perfect: a storm the previous two days had dumped over two feet of fresh on top of a great base. Temperatures were cold, but nice. Not a cloud in the sky. Mountain riding is demanding, and as the day wore on Jon and I spent more & more time watching Brandon and Cody do their thing. Watching those kids ride was like poetry, and they're as nice as they are skilled. 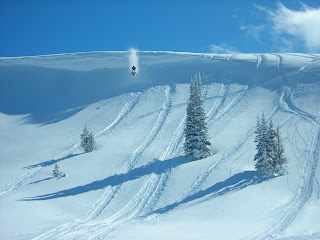 This photo shows Cody dropping the biggest cornice of the day, launching about sixty-feet into a perfect runout landing. Absolute sweetness. It was likely the nicest winter day of the season, and we happened to be out there in it. Good friends, great day, memorable times. The stars were aligned, and I was left with an ear-to-ear grin. Good for you! And beautiful photos. I can't wait to come back home and see those mountains again! Only one more week!